Slip into the rhythm of 6.76 million bodies, join in a game of backgammon and find out why the Egyptians call this place Umm al-Dunya or ‘the mother of the world’. Just make sure to rock up in time for tonight’s welcome meeting. There’s old, and then there’s the necropolis of Saqqara. Soak up some ancient history, meander Coptic Cairo and get your haggle on in Khan el-Khalili market. Refuel with a mint tea or keep exploring. Julius Caesar, Cleopatra, Lord Byron... They’ve all done it. Go low tech with a ride on a traditional felucca sailboat down the Nile. Switch to a motor boat to take in views of the Mausoleum of Aga Khan and Tombs of the Nobles before we jump ship at a Nubian village. Check out the four colossal statues at Abu Simbel and visit the Temple of Hathor – built in honour of Queen Nefertari – before drinking in the magic of the Nile at sunset. 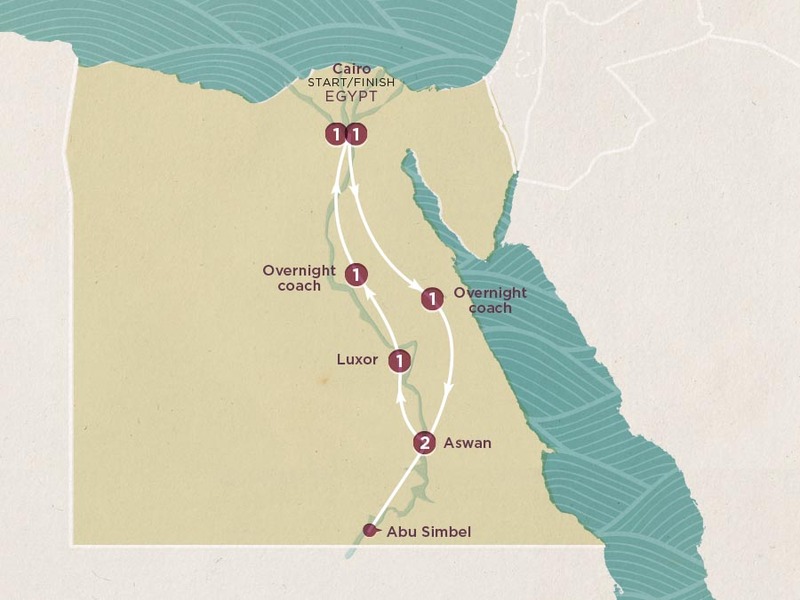 Today we’re jumping all aboard our air-conditioned mini bus to Karnak for a touch of Luxor. Once the capital of ancient Egypt, it’s now a history-strewn landscape of souks and temples. Walk like an Egyptian into King Tutankhamun’s treasure chest at the Egyptian Museum – home to over hundreds of relics – then gain some perspective at the base of the 138 metre Great Pyramid of Giza. This hunk of ancient architecture could be remodelled into 30 Empire State Buildings! Throw in a photo op at the incredible sphinx (mythical half-lion-half-man statue) and you’ve got yourself a pretty epic day of sightseeing. The trip ends here (well, breakfast first), but pop on that fedora and keep on exploring, Indy. New York may tout itself as the city that never sleeps but it’s got nothin’ on the Big Mango.